This liquor-distilling kit by Vienna designer Francesco Morackini breaks down into four perfectly innocent household objects. The Prohibition Kit comprises a fully-functioning cooking pot, fondue stove, fruit bowl and watering can that can be combined to brew alcohol at home. "Producing schnapps, liquor or alcohol is very restricted by the law in most countries," says Morackini. "The separated elements are legal but put together the objects become illegal. I wanted to explore the limit of legislation." The set is primarily made of copper. "This material has always been used for the construction of stills since ancient times," explains the designer. "With the evolution of time and technologies, new materials have been introduced such as stainless steel, but old Europe will by no means exchange their copper stills." 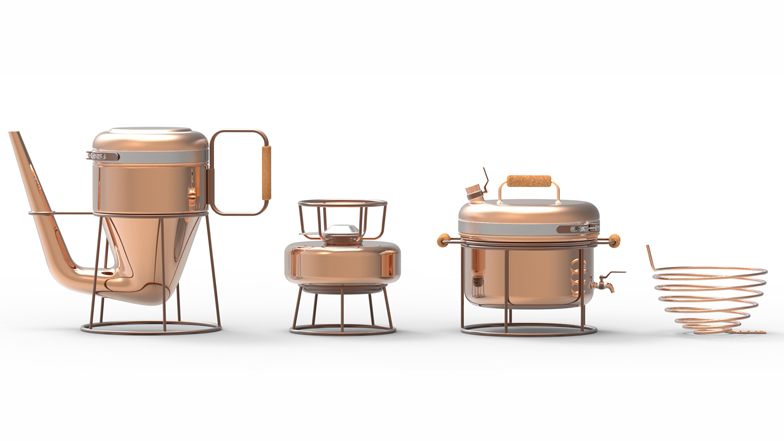 His design won first prize in the professional category of the Copper and the Home 2012 contest organised by the Italian Copper Institute. Francesco Morackini studied industrial design and management then worked in Brazil, the United States and France before establishing his studio in Vienna.